Back when she was a newly-minted Ph.D., Ayana Arce struggled to picture her future life as an experimental physicist. An African American woman in a field where the number of black women U.S. doctorates is still staggeringly small, Arce could not identify many role models who looked like her. “I didn’t know what my life would look like as a black postdoc or faculty member,” Arce said. But in the end, Arce – an associate professor of physics at Duke who went on to join the international team of physicists who discovered the Higgs Boson in 2012 — drew inspiration from her family. “I looked to the women such as my mother who had had academic careers, and tried to think about how I could shape my life to look something like that, and I realized that it could be something I could make work,” Arce said. Adrienne Stiff-Roberts, Fay Cobb Payton, Kyla McMullen, Robin Coger and Valerie Ashby on stage at the Hidden Figures No More panel discussion. Credit: Chris Hildreth, Duke Photography. 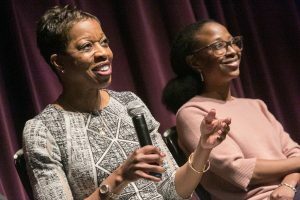 Arce joined five other African American women faculty on the stage of Duke’s Griffith Film Theater March 23 for a warm and candid discussion on the joys and continuing challenges of their careers in science, technology, engineering and math (STEM) fields. 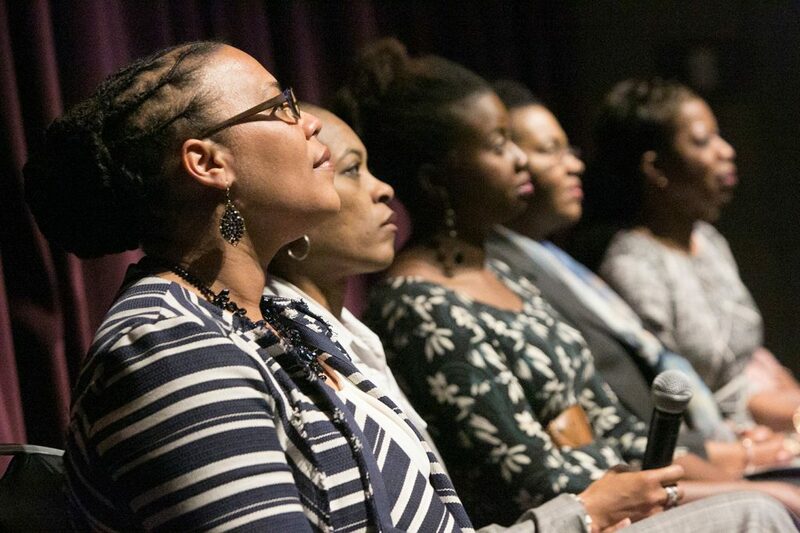 The panel, titled “Hidden Figures No More: Highlighting Phenomenal Women in STEM,” was inspired by Hidden Figures, a film which celebrates three pioneering African American women mathematicians who overcame racial segregation and prejudice to play pivotal roles in NASA’s first manned space flight. The panel discussion was spearheaded by Johnna Frierson, Director of the Office of Diversity and Inclusion at the Pratt School of Engineering, and co-sponsored by the Duke Women’s Center. It was followed by a free screening of the film. Though our society has made great strides since the days depicted in the film, women and minorities still remain under-represented in most STEM fields. Those who do pursue careers in STEM must overcome numerous hurdles, including unconscious bias and a lack of colleagues and role models who share their gender and race. Stiff-Roberts and the other panelists have all excelled in the face of these challenges, making their marks in fields that include physics, chemistry, computer science, mechanical engineering and electrical engineering. On Thursday they shared their thoughts and experiences with a diverse audience of students, faculty, community members and more than a few kids. Many of the panelists credited teams of mentors and sponsors for bolstering them when times got tough, and encouraged young scientists to form their own support squads. Valerie Ashby, Dean at Duke’s Trinity College of Arts and Sciences, advised students to look for supporters who have a vision for what they can become, and are eager to help them get there. “Don’t assume that your help might come from people who you might expect your help to come from,” Ashby said. The importance of cheerleading from friends, and particularly parents, can never be overestimated, the panelists said. Women in STEM can also be important and powerful allies to each other, noted Kyla McMullen, an Assistant Professor of Computer and Information Science at the University of Florida. With all the advice out there for young people who are striving to succeed in STEM – particularly women and underrepresented minorities – the panelists advocated that everyone to stay true to themselves, above all.